Anyone else thanking jeebus that it’s the weekend? I seriously need to sleep in. This morning we had dueling snooze buttons. AdRi’s alarm, snooze. LeLo’s alarm, snooze. Repeat 10 times. Tomorrow? I’m sleeping in. So the bruddah doesn’t post to his blog much anymore since he’s busy busy with a new baby and all, but he sure does send some nice ones. I take it it’s my duty to share them with you. And I threw in some extra goodies for the hell of it. Bon appetit! 3. Take a few moments and dream with Sigur Ros. 4. But is he wearing any pants? 5. Watch out for mean Elmos. 6. While there are no photos to substantiate it, the parental unit happened upon a Bible Retail Outlet at their local outlet Mall in San Marcos, Texas. Parked in front was a truck, with a goat in back. My dad thinks it was for sacrificial purposes. What can I say? It runs in the family. 7. And finally, the frequent poster here known as Anonymous L has finally gone and done it: she has a blog. Welcome Bemused! Happy weekends peeps! Oh, and if you live in Portland, word is we're going to have a break from the rain this Sunday! Wow! Lelo, I just stepped out to have my weekend cigarette, and the sky is clear. I saw STARS! Today at my glamorous waitressing job, the SUN was shining in my EYES! I felt like a vampire when I saw it. I squinted and said, "What is THAT?" I hope you girls are going to join me for over 36 fun tomorrow night???? You should be up by 5pm, don't you think? 1. I ALWAYS need more cowbell. 2. I'll have to tell my sister @ the Elmo. She works in the Sesame Street division of Mattel. 3. Hasselhof? I need to find the Playgirl Burt Reynolds w/ the pugs. Creeps me out to this day. 4.Hair-all-over-face man. Oh, I love him. I've seen him on several televison specials. Did you know he's got kids? And I think they're relatively hairless? BIZARRE! HAVE A GREAT WEEKEND LeLo and AdRi!!!! Animal sacrifice? Oh, baaaaaa-d idea! Sorry, couldn't help myself. That was just begging to be said. Oops, where are my manners? Thanks for the welcome to the world of blogging. 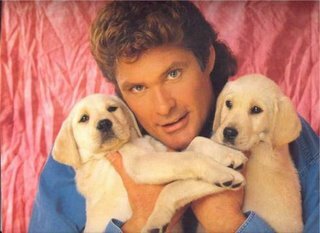 hasselhoff...puppies...what could be better. if i had a school locker, that would be hanging in it. yet another brilliant and entertaining post, Lelo! 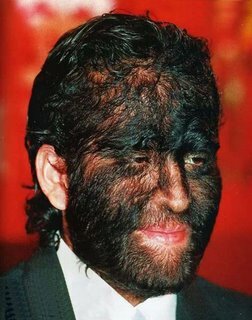 It's funny that you posted the guy who needs a razor. Are you a CSI fan? Did you see it last week or maybe two weeks ago, when they had Leisha Haley playing a girl with that same affliction? Totally unrelated...my patner and I were talking about how much you look like a friend of ours. I guess you have a doppler ganger. Anyway, I met said friend for a doggy play date this afternoon, and she was wearing a scarf that looks exactly like the one you were wearing in the self protrait Tuesday picture. It was freaky. I missed the special on TBS (the global warming one)and they have yet to repeat it. David Hasselhoff never wears pants unless he is on tour in Germany and then it's lederhosen without a shirt. Hope you managed to get some sleep. Sleep. It's a good thing. i love that will farrell. and am glad you get some sunshine. you deserve it, big time! enjoying day 2 of sun here. Girl, I'm definitely hitting you up to Boards of Canada. Just you wait my friend.